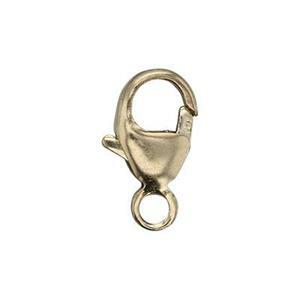 A lovely gold filled jewelry clasp that is easy to grab and manipulate. Lobster claws are a premium choice compared to economy spring ring closures. This pear shaped trigger looks best with larger diameter round link jewelry chain styles. Learn more about gold filled material in our reference articles online. Lobster clasps contain an internal steel spring for the trigger function. Great clasp! Very good quality. Exactly what I would expect from Halstead. Thanks. A cute dainty clasp! I prefer to use these with my necklaces. Since it's quite small, I think the clasp could be difficult to connect if using it for a bracelet. I prefer not to take the risk with my customers.